"[Challis] heard a loud chaffcutter rattle overhead and looked up. It was a 1942 Kittyhawk fighter." This second in the mystery series set on a peninsula close by Melbourne on the southern coast of Australia shows Disher at his equivocal best. The police officers central to this series are good people at heart, but they’ve got issues…which interfere with their policing. Once again, we find wicked townspeople committing crimes, but it is the police we are watching, horrified as they bumble their way into yet another indiscretion. We fear that if we take our eyes from them for a moment, we will miss the next questionable (and objectionable) behavior. Southern Australia never looked so lawless as in this spit of land popular with holiday-goers yet filled with low-rent year-rounders struggling to make crime pay. In this installment, we have a member of “International Most Wanted,” rapists, drug-pushers, marijuana growers, and baby-killers. All the while we sense a deep vein of Disher humor keeping the whole wildly improbable fiction from spilling over into downright absurdity. I like the way Disher thinks. He’s funny, but there is an edge there that reminds us of underlying truths. Just a thought: for a story written on a narrow peninsula, there is precious little discussion of the sea. The peninsula isolation is complete even without Disher's mentioning shifting sands, the color of the water, or the quality of the air. It is unrelievedly dry and dusty. So is the rest of Australia, really, which makes us wonder what is the quality that makes this any different from any "bush" mystery. There is a coastal tang to the culture, then. One senses flip-flops and sees a few surfboards. The ocean creeps in unheralded and unremarked. There are no black people, and in fact, there are immigrants. One rarely (if ever) finds immigrants out "bush." Just a thought. "...both sides began a desperate rush for gunpowder." Philbrick knows how to inhabit and interpret a battle scene. From earlier books like The Last Stand and now with Bunker Hill, Philbrick allows us to imagine in detail the layout, action, and tension in a battlefield exploding with ordnance. Because we now know more about the personalities of those men involved in the battle, have letters from survivors and rooftop observers, and battle reports of the period, we can interpret to some extent how the battle for Bunker Hill must have developed and played out. It was grim. It was bloody. The provincials had very little gunpowder but buckets of bravado. The British took Bunker Hill that day, but the loss did nothing more than whet the appetite of the provincials for the freedom they craved. Paradoxically, it crushed the spirit of the British generals and spurred the leadership and fighting men of the colonies to an even greater resolve to isolate and eventually push the British out of Boston. A fascinating new series of maps created for the book and dated 2013 by Jeffrey L. Ward are a revelation. Boston of today bears almost no resemblance to the Boston of 1775-76 when Boston city itself was practically an island reachable only by water or by a very narrow neck of land reaching into Roxbury. Ward’s maps follow the scenes of Philbrick’s history closely and add immeasurably to our grasp of the action. Another thing that stands out is how little fighting actually took place before the colonies declared independence in the summer of 1776. Hostilities continued afterwards, but “the Battle of Bunker Hill…[proved] to be the bloodiest engagement of the eight years of fighting that followed.” The provincials lost the Battle of Bunker Hill and sustained heavy casualties, but they appeared to come away from that time with a sense of their own power, and with determination. Best of all may be the portraits drawn of James Warren, kinetic man-about-town, physician, politician, and leader who rose from his sickbed to participate (and die) in the Battle of Bunker Hill, and George Washington, gentleman general, who came up to Boston afterward to lay out the Siege of Boston. Washington succeeded in pushing the British from Boston with almost no conflict. He had prepared so well in surrounding the city, he was actually disappointed he did not need to put his plan into action. Philbrick is at his most eloquent in his chapter entitled “The Fiercest Man,” in which he describes George Washington. One of my deepest impressions from this book comes from this chapter, where Washington is rendered human. He was a large man, physically gifted and well-proportioned, who looked well on a horse: “There is not a king in Europe that would not look like a valet de chamber by his side.” He appeared to listen and accommodate another point of view from his own while managing, in the end, to carry his own. When Washington learned that the provincials were essentially without gunpowder, he was struck silent. “Could I have forseen what I have, and am about to experience, no consideration upon earth should have induced me to accept this command,” he later mused. The book has 32 color plates, including Charles Willson Peale’s standing portrait of Washington with his hand on a gun barrel, and 30 black and white reproductions that allow us to put faces to names. This is a delectable, detailed history, adding to our store of knowledge, and a modern one: there is some discussion of attractive women, married or not, whom Warren and Washington were allegedly interested in. I assert, whether or not we think these details realistic, true, or relevant, they make these men more accessible to us, and we begin to wish we had more remaining clues about the lives of all these forbears so as to refute or confirm these theories. Addendum: Philbrick tells us the painter Gilbert Stuart wrote that he suspected George Washington of harboring the “strongest and most ungovernable passions.” When I described this, from the chapter “The Fiercest Man,” to a 90-year-old Boston native, she acerbically rejoined, “One can see his passion, him in those pants," referring to her memory of Stuart’s full length standing portrait of Washington now hanging in the Museum of Fine Arts in Boston. One wonders if that portrait tells us more about Gilbert than about Washington. On a hot, almost windless afternoon in June, a seven-year-old boy stood beside his mother and looked out across the green islands of Boston Harbor. To the northwest, sheets of fire and smoke rose from the base of a distant hill. Even though the fighting was at least ten miles away, the concussion of the great guns burst like bubbles across his tear-streaked face. Warren had saved John Quincy Adam’s badly fractured forefinger from amputation, and the death of this “beloved physician” was a terrible blow to a boy whose father’s mounting responsibilities required that he spend months away from home. Even after John Quincy Adams had grown into adulthood and become a public figure, he refused to attend all anniversary celebrations of the Battle of Bunker Hill. Over the more than two centuries since the Revolution, Boston has undergone immense physical change. Most of the city’s once-defining hills have been erased from the landscape while the marshes and mudflats that surrounded Boston have been filled in to eliminate almost all traces of the original waterfront. But hints of the vanished town remain. Several meetinghouses and churches from the colonial era are still standing, along with a smattering of seventeenth- and eighteenth-century houses. Looking southeast from the balcony of the Old State House, you can see how the spine of what was once called King Street connects this historic seat of government, originally known as the Town House, to Long Wharf, an equally historic commercial center that still reaches out into the harbor. Alice Walker is an old radical. Just when you thought the U.S. government under Obama must indeed be “liberal” because the Republicans keep telling us so, Walker comes along to say, no, Obama’s policies are a long way from liberal. Reading Walker, we can see what “liberal” really means. It is refreshing to me to have someone thoughtful (but not a political consultant) give a considered opinion on anything these days. Walker surprises me with the range of her concerns and the vehemence with which she addresses them. She has so much generosity, respect, and righteous anger built in to her worldview that one wonders how such a person would govern. A Daoist, perhaps: “Let the forces rule.” But really, Walker is a spiritualist of every sort. She is animist, Buddhist, Christian, Muslim. She believes in the basic tenets common across religions: Be thoughtful. Be kind. Be generous. Enough is as good as a feast. This is a book of essays, letters, articles she has written for publication, diary notes, or sometimes transcripts of lectures she has given. It gives us Walker’s thinking, the things she has struggled with, the things she struggles with still. More importantly, it gives us some idea of how to approach our own thinking about problems that plague us. Take, for instance, the question of Pfc. Bradley Manning. Manning was the young man who allegedly gave government secrets to Julian Assange to publish. How should we deal with this question in an enlightened way? What is the best solution? I guarantee Walker will make you question again things you thought you’d already decided. One of the pieces in the book that I liked best was “12 Questions: Korean Women’s Soul Questions.” South Korean women, confused about how to live fulfilled in the strict patriarchy of South Korean society, asked Walker and a prominent South Korean feminist, Hyun Kyung Chung, for their opinions. Some of the questions are ones we have heard before, e.g., Can women and men be friends? Should women change their bodies to interest men? Walker’s responses are always interesting and get right to the heart of this old radical’s worldview, encompassing all her deepest themes. This is a woman who has studied oppression of one kind or another her entire life and knows whereof she speaks. Anyway, Walker’s articles in this book are a short sharp shot of something strong and fiery. It goes right to the bloodstream and jumpstarts the brain. Of course, it can only be taken in small doses, but you may find you develop a taste for a woman with opinions, and crave to hear what a bright, thoughtful human might say on the state of our affairs. Her point of view adds depth and richness to the human response sent into the universe when negotiating the maelstrom that is life. Gillian Mears’ searing novel of Australia, Foal’s Bread, was sixteen years in the making. It was published in late 2011 with the publishers Allen & Unwin, and then proceeded to win the 2012 Australian Prime Minister’s Literary Award for Fiction and The Australian Literary Society’s 2012 Gold Medal while also winning or being shortlisted for eleven other Australian prizes. While apparently still not available in bookstores in the U.S., it is available new or used from mostly overseas sellers on Alibris, Amazon, or Barnes & Noble. It is worth seeking out. It is high on my list of “Best of” fiction reads for 2013. 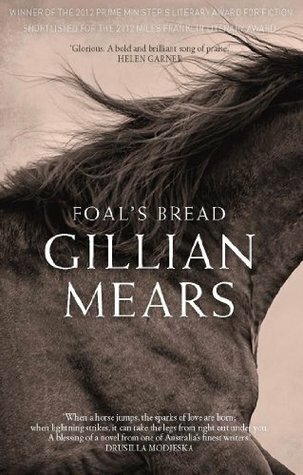 This unforgettable saga of a horse woman and her family living in rural New South Wales begins in 1926 with motherless Noey on a pig drive with her pa, Cecil. Her father is proud of her: “wasn’t no horse too tricky that my daughter couldn’t git over a…ladies’ high jump.” So the two of them sign up for the Port Lake Show, one of many such country shows all around Australia in the late summer and fall. Noey is fourteen, and ”built small…she was like a pony come out of the scrub. The hair on it just like a sun-bleached flaxen mane.” At that show Noah meets her future husband, Roley, a consistent winner on the showjumping circuit. Hard-hitting and psychologically complex, this fiction centers around a fully realized and unrepentantly sexual woman. She is both grasping and generous. She feels more than she expresses and bears as much as she is able. She is tender and terrible in jumping the hurdles in her life, bringing us the sense of a whole person. She is unable to keep her husband and all three children safe from harm, and this knowledge weighs on her. There are several daring, disturbing, and thought-provoking themes running through this novel, one of which is sexual love for a much older partner. Mears has us wrestle with our feelings about this to some effect. We are unsure what to make of her characterization of the love between Noey and Uncle Nip, and this adds to the complicated feelings we experience while we read. It is quite thrilling to be once again unsure of oneself when presented with the power of her storytelling. The story itself is rounded and full, holding all the complicated emotions, joys, and disappointments of real life. The language is strong and farm-style frank. We watch two generations on one family farm over a period of some eighty years. The baby George, born “special” and a little simple, makes his family’s lives more joyous than they might otherwise have been because he reflects their love back two-fold. Special, indeed. Roley, Noah’s showjumping husband, struggles with despair as a wasting disease hijacks his limbs. Noey charts his decay, and denied the comfort of her husband’s body, passes through every stage of grief. Suppression of her natural tenderness causes her personality to twist. The passage of time is marked through the growth and seasonal change of a jacaranda tree, for under its spreading branches and purple blossoms major events are marked. The tree lives on through drought and flood, and just becomes more beautiful as it ages. I still wonder why Mears ended the book the way she did, for I didn’t think her ending was as inevitable as she made it feel, but I concede it does show once again the confusion and emotional distress tearing apart an older Noey. After finishing this book, you are likely to be curious about the author, rural New South Wales, and the early days of showjumping when obstacles were stacked impossibly high and the country shows were exhilarating and extraordinary. Mears explains her research and her writing in this audio interview with the ABC Book Show host, Anita Barraud. Mears herself knows something about an unexplainable muscle-wasting disease, for she has struggled herself with Multiple Schlerosis for some years. The mystery and arbitrariness of that disease forces a furious frustration on all that come in contact with it. And what is a foal’s bread? It is not exactly clear, but it appears to be a lump of tissue found within a foal’s placental birthing sac. Dark, hard, and heavy at the birth, it can be dried out, passing through stages until it is light colored and lightweight. It is a rare enough find to be considered a lucky event. "You will have no time to childproof the house (trust me) between the time the baby is born and the time it is old enough to aim and spray paint remover into its mouth." There is a moment in every parent’s life when they wish they had someone to talk to about their child’s behavior—and their own response to it. They may not take the advice, but it’s nice to know what other, experienced folk do that seems to work well. Clyde Edgerton has a comfortable way of raising those pesky issues of childrearing and making us laugh about how we solve (or do not solve) them. He makes a great deal of sense, and makes us more comfortable with our sometimes creative solutions. Most of all, he makes us love children for being the baby humans they are—for mimicking, for coming out with the most amazing questions, for learning manipulation early. This is a small book, the smallness of which any parent can appreciate. New parents quickly find that time is one thing they have less of with a new baby, and Edgerton’s advice on setting up the car seat early is wisely put in the front of the book: Getting Ready. The frustration of installing the seat prepares the new father for what will come…setting up the crib. He helpfully instructs the new father to put it together inside the room where it will be used, since it very likely will not fit through the door when it is finally put together. Parenting can be hard, especially if we don’t learn early that consistency resolves many daily battles. It’s just figuring out what we want to hold as the standard that may be difficult. Edgerton speaks with the voice of the experienced Dad, one who has figured out many ways to be fair at the same time he is saying “no.” He writes as though he would be a great grandparent—he hasn’t lost the joy of a new baby, or a questioning toddler, or an experimenting teen. The love shows through, which is what each of us hopes for in our families. He is a Considerably Older Dad, or COD, and writes some advice for other CODs separate from the text in little boxes. I especially loved the short section reminiscent of “Kids say the darndest things,” or Edgerton reminding us that sometimes kids seem to grow up when we aren’t looking. Suddenly one day they will point out, with an adult voice and a complete sentence, they have completely grasped something we thought was beyond them still. We feel foolish and proud and on the verge of laughing at ourselves at the same time. His advice is sound, and I’m sure new fathers will find much in it to help them to relax into their new life as parent and to be creative in their own individual way: to think of new games, or stories to tell, or fun things to do with their child at the same time one sets reasonable limits and allows for diversity. Parenting is hard, but it can also be fun, and Edgerton helps us with one while reminding us of the other. If there is going to be a new father in your family, don't wait until the baby is born to share this wonderful little book. It covers preparing for fatherhood, something I am certain is on the minds of fathers-to-be.